Sepia tone portrait of bay gelding, trotter Charles Watts, H. Meader up, on the first day of the Topsham Fair sponsored by the Sagadahoc Agricultural Society. 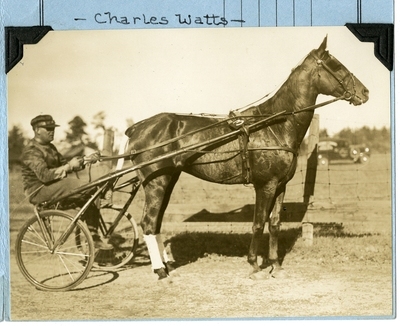 Charles Watts came in third after three heats of the 2.19 Trot on Tuesday, October 9, 1934. The program includes the following notice: In memoriam. Isaiah R. Morrell. Born, July 2, 1869, Windham, Me. Died, March 17, 1934, Brunswick, Me. According to the 1920 U. S. Federal Census, Morrell was a horse dealer.